Home PROJECT PANDA My China panda journeys 06 and 08 PANDAS PANDAS PANDAS!!! A DAY OF PURE BLISS!!! PANDAS PANDAS PANDAS!!! A DAY OF PURE BLISS!!! Hey everyone!!! Diana and I are both here writing this and we are still pretty well speechless so BEAR with us!!! 8:00 AM,Lichunlin from the Panda Base picked us up at the Crowne Plaza Hotel (5 star..thanks Steve!!) and he and his driver brought us through Chengdu to the edge of the city where the Panda Base is located. From that point on it was absolute pandamonium!!!!!!! Next we got to peek in behind the scenes at Bing Bing having bamboo breakfast in her enclosure. She is my baby “Jewel’s ” mother and so beautiful and feminine!! Immediatly after seeing Bing Bing and a few other pandas in their enclosures we stood in an open small courtyard with a funky log bench and out of nowhere comes a panda keeper with arms FULL of panda baby. Ohhhhhhhhhhhhhhhh it was “Jewel”!!!!!! The tears were flowing!! They instructed me to sit down on the bench and plopped my baby girl in my lap..lying on her back. She was sooooooooo cute. I wanted to hug and kiss but could see she was a bit confused so I just smiled for the cameras and tried to hold the tears back to keep me from looking like a panda too with mascara rings under my eyes. We learned later that this was Jewels first contact with anyone but her keeper. WOW what an honor!!! After I was done, Diana got to hold the baby as well and we both were pretty much rendered speechless. It was a moment in time we will never forget!!! We hope we can visit her again as she grows up and see her have children. She will remain at the Panda Base indefinately we are told. After our Kodak moment we were whisked down a corridor to an open area where the yearling babies were munching on their bamboo. NINE of them!!! OMG it was unbelievable!!!! Pandas everywhere and all so chubby, shiny and content. We were smiling so much our cheeks were hurting!!!! Somewhere in this busy morning we hauled large wheelbarrows of freshly washed bamboo through narrow pathways and a number of visitors. When we stopped we were asked if we wanted to feed the bamboo to the pandas. Oh you betcha!!!!! We threw spears of tender bamboo to a large group of youngsters who came running and a few so enthusiastic that they took a tumble down into the moat to get their precious boo. It was so funny to see they munching and ripping leaves all at once. You could hear their teeth grinding on the stalks from a long ways away. They sound like goats when they vocalize!! We then got to view a half hour cinema film about the Panda base and were treated to a gourmet authentic Chinese lunch at what they called a “cafeteria”. It was some of the best food we had in China!!! Following lunch we were instructed to remove our hospital gowns so we could meet the directors of the Panda Base who would be presenting me with an adoption proclamation in front of the giant gold gilded bronze statue at the center of the panda base. Our guides interpreted as the directors spoke very little English. The small ceremony moved me to tears (again). Diana along with the photographers took some incredible photos and when I looked up at her was the moment I lost it.. The people at the panda base were so grateful for my donation and displayed their gratitude to both Diana and I for being there at every turn. We cannot thank them enough for making our experience so very special. If that wasn’t enough emotion for the day, we were invited to a special room to have “tea” with the officials which gave me the perfect opportunity to present the book I created as a gift for the panda base. As I turned the pages of the book the directors watched with great interest and the photographers shutter was clicking on every page. I am SO happy I did this. Finding the perfect gift was really hard for me but they really seemed to appreciate it. We sat down again and more surprises were plopped in our laps. Diana and I each recieved a big bag full of very special gifts from the panda base which included a 10″ tall adorable stuffed panda, panda calendars, the official high gloss publication of the Panda Base that comes out every 3 months, brooch pin, key chain, and the crowning glory ………….a beautiful red presentation box for each of us which contained none other than paper made from panda poo which was artistically painted in Chinese brush style with little pandas and bamboo and signed by the artist. We are the ONLY folks that will ever have these other than those who attended the Panda Base 20th Anniversary which was earlier this winter. When we were scooping poo in the morning I asked if they were making paper from the panda poo and lichunlin got really quiet but said “yes” very quietly. Little did we know he sent his staff to hunt down these two last remaining poo art scrolls for Diana and I!!! What a surprise!!! In the afternoon we picked up all the old bamboo from an outdoor enclosure which ironically contained 2 , 10 year old girls who actually got along very well. We tied these old stalks into bundles (this is done for each enclosure twice daily) we hauled them out to the composting area. Boy did we feel like novices trying to tie a stupid slip knot….we called the panda keeper over to show us the way she liked it done and she got a real kick out of us. It was actually like gardening and felt good to get a bit muddy! Now time to “plant” newly washed bamboo. We each would grab 5 or 6 cut stalks at a time (these were wet!!!) and set them upright in tubes that were counter sunk into the ground. Almost like potting the stems. When all of this was done we were taken outside of the enclosure and the pandas were let out to find their meal all ready and waiting. The girls certainly detected that something different had gone on in their yard. They sniffed the air and scented the ground and trees a lot in the area where we had been working. We stood for at least an hour watching and photographing while they ate and played. One of the girls was very active and we were told she had just begun estrus and will be bred this time around. When the girls got bored with their food and wandered off from our sight we were led down another bamboo lined pathway to another panda yard where we got to help exercise 2 , 4 or 5 year old male pandas. They were encouraged to walk on their hind legs using food on the end of a long bamboo poll to help strengthen their back legs for breeding purposes. It was pretty entertaining as Diana and I held the pole with panda bread secured on the end (well Dianas bread was not so secure..lol…pix to come) as we walked the length of the moat with bread held high and dancing panda walking parallel to us. It was a hoot and we drew quite a crowd! We also got to throw apples to the pandas which they adored!!!! The museum was closed so we unfortunately couldn’t go in but we heard from our guide yesterday that is pretty impressive. Our long and awesome day was drawing to an end but not without my nabbing a gorgeous hand painted panda silk scarf from the gift shop. Lichunlin and his driver brought us back to the hotel and we treated ourselves to a McDonalds dinner!! Has anyone ever had a Quarter Pounder with cucumber slices instead of pickles, spicy thousand island instead of mayo and a waiter who took your order and delivered your food??? Well WE did!! LOL! Actually it hit the spot. Comfort food!!! We love all the awesome food we had in Thailand and China but there comes a point where MickeyD’s is the only thing that will do! We were given 2 CD’s of pictures and a video tape of what we did from 8AM until 4:30PM. We have been having problems sending the cell phone pictures from Chengdu. Maybe will work tomorrow when we get back to Bangkok. Then the next morning off to the States. Oh our aching backs..especially Dianas!!!! Leave Wednesday AM and Diana arrives in Des Moines Wednesday PM after flying for nearly 24 hours! We may get to write again but if not…we will be posting pix very soon…some REALLY nice ones. Panda hugs from Sandra and Diana!!!!! Wow! Can’t wait to see the pictures of you with your baby! WOW!! WOW!! WHAT MORE CAN YOU SAY. LOKKING FORWARD TO THE PICTURES OF YOUR BABY. I’ve loved all these blog posts that I haven’t responded to, including the wonderful Year of the Rat guy. I can’t wait to see the photos. Your panda day sounds out of this world! I agree with Jim…WOW says it all!! Can’t wait to see the pictures. Have a safe trip home. Oh, by the way, I’m home again. School dismissed at 10:30. I’m counting on the two of you to bring some GOOD weather home with you. Hi Sandra! I emailed you also. I somehow stumbled on to your blog here and then it took me awhile to figure out who you were and then I remembered because of your FABULOUS jewelry. I had tears in my eyes reading your obvious joy at meeting…at LONG last, your baby girl!!! I am so happy for you. You are living the dream so many of us have and I think it is just extraordinary and I thank you SO MUCH for sharing this with the other panda lovers in the world! Your day was well told and thank you for letting us know how your trip has been going. Absolutely amazing!!! Thank you for sharing your incredible experiences! I’m really looking forward to your pictures. Have a safe trip home. Thanks once again for sharing your trip with all of us! I want to go next time! Have a safe flight home. Will look forward to more pictures when you return. I also felt the shake ,,,,and had the tears in my eyes holding your baby is very moving ,I remembered the feeling as if it is my own experience . waiting for pics and all the details ,, kisses and hugs for you and Diana. It is so wonderful reading about a dream come true. I have dreamed of a trip to China to see and touch the pandas. I don’t know if it will ever come true. It is fascinating and rewarding to hear about others. It is almost like I am there too. I am so happy for you both. I can’t wait to see all the pics. Have a safe trip home. Thank you so much for sharing. Hi Sandra and Diana…THANK YOU so much for shring your wonderful adventures with us. You are incredible to think of us during all of your wonderful experiences….I can picture you in Panda Heaven with Jewel and her Mom and all of her buddies. 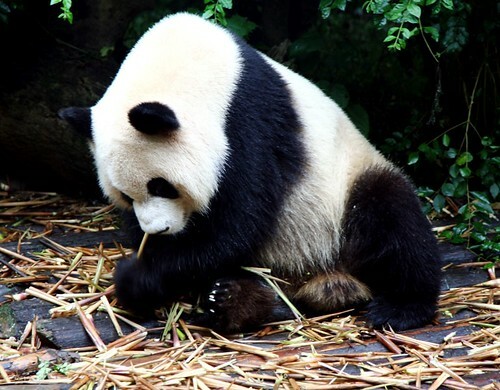 Have a safe trip home and we look forward to lots of wonderful Panda photos…. All I can say is wow and thank you so much for sharing this amazing experience with all your friends back ‘home’. I know I would have been crying right along with you when Jewel was place in your lap. I am so happy that your trip was so beautiful and will hold the happiest memories in your heart!